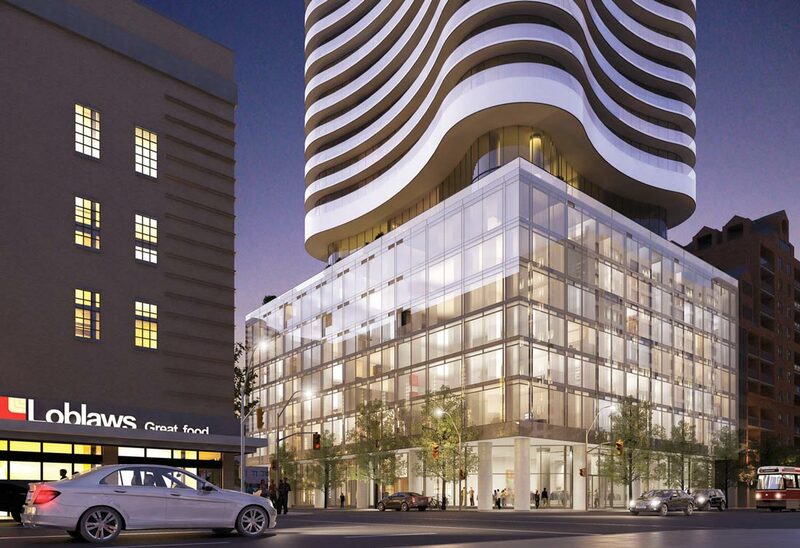 The Stanley is a new condominium in pre-construction located at 70 Carlton Street in downtown Toronto. (Church and Carlton). Stanley Condos is located near Ryerson University, University of Toronto and the College Subway Station. Prices start from the high $200,000’s and proposed occupancy date is January 2019. It is proposed that the 7 storey base will include ground floor retail and 125 residential units. The 38 storey tower above the 7 storey base will be uniquely shaped with curved lines. The total gross floor area for the overall development is 36,011 square metres of which 845 square metres is for retail space and the 17 square metres is for the commercial lobby area. The 13 residential rental units (12 bachelors and 1 one-bedroom) of which 5 are below grade are currently located at 72 Carlton Street. In the proposal, they are to be demolished and then replaced with 13 units being situated on the 2nd floor and in the basement level of the Stanley Condos which will consist of 1 bachelor unit, 8 one-bedroom units, 2 two-bedroom units and 2 three-bedroom units of similar size to the existing rental units. Therefore, of the total 600 proposed residential units at this site, 13 will be for the rental replacement units. 36 % will be for studios units (215), 42 % for 1-bedroom units (254), 12% for 2-bedroom units (71) and 10% for 3-bedroom units (60). Unit size range from 360 square feet. All suites on Levels 10-34 to include balconies. Select suites on Levels 3 -7 to include balconies, as per plan. Non-terrace/balcony suites on Levels 3-7 to have oversized sliding doors to Juliet balcony. 9′ ceilings heights on levels 9-37 and 8′ 1/2″ ceiling heights on Levels 3-7. There will be a total of 202 proposed parking spaces in the 5 level of underground parking garage with access from a driveway to Church Street of which 152 will be for the residents of the building and 50 will be for commercial parking spaces. There will also be a total of 543 proposed bicycle parking spaces of which 422 are for the residents, 113 are for visitors and 8 are for non-residential uses. There will be 1 loading dock. The total indoor amenity space proposed is 755 square metres on two levels. 588 square metres will be on the 8th floor and 167 square metres will be on the 9th floor. There will also be 839 square metres of outdoor amenity space on the roof of the 7th floor. Amenities include a fully equipped fitness facility including yoga studio, private dining room, party lounge, guest suite, meeting room, theatre room and there’s also an 8th floor roof terrace with water feature, outdoor bar, BBQ’s, zen garden, lounge area and sun deck.